Dingy Drain-Pipe is the first level of Pacifica, and it only appears in the Game Boy Advance remake of Donkey Kong Country 3 where it is featured as the thirty-first level. This level takes place in a partially-flooded pipeline. It features a combination of underwater segments and ones on land. Dixie and Kiddy Kong must swim through the dark pipeline and jump in and out of small passages. As its name implies, Dingy Drain-Pipe features the water level drop in certain segments, and it prevents the monkeys from backtracking. 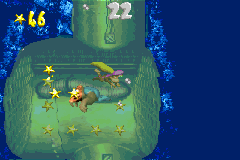 During the second half in an underwater segment, the Kongs can optionally open an Animal Crate containing Enguarde to assist them during this part. 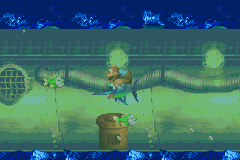 Dixie Kong swims under the first Bonus Barrel. The level begins with a straight pathway down through a gap, in which the Kongs must fall into to reach a lower area. Heading east in this area, they pass some Bristles and soon fall into another gap. The apes, upon falling, are caught by the waters flooding some of the pipeline. They must continue downwards in the drainpipe and maneuver around a few Lurchins to enter the next area. There, the heroes find a westward path to follow. Swimming through this enemy-filled pathway, the Kongs find many Lurchins, most of them moving in a vertical pattern. After passing a few stationary Lurchins, the apes take a narrow pathway down south. At that point, the water drains, and the heroes will be stranded in the lower area of the pipe. However, once they avoid some Kocos, the monkeys find the way back on dry land by using an Auto Fire Barrel. Heading east there, they find the Star Barrel. About halfway into the level, the Kongs cross a small gap, hitting a DK Barrel. A group of Bristles move towards the Kongs once they cross the gap, but they can easily be defeated with a cartwheel attack. The monkeys must jump into a flooded area of the pipeline after that, which takes them to an area full of Kocos. The Kongs have to dodge each one of the small foes, and soon head downwards, following a trail of bananas. Dixie Kong and Kiddy Kong find themselves in another area full of Lurchins as they progress, and they need to swim between two of the sharp foes to continue. This, however, can be tricky, as a third Lurchin can be found between the enemies as well, moving around in the small space. Once the apes find their way around the underwater enemies, they travel through a narrow passageway to find a large, open area. If they pass the No Animal Sign with Enguarde, they are rewarded with a Bear Coin. As they hover down to the floor in this area, the water level in greatly decrease, until it disappears. Now in a dry pipe, the monkeys must walk to the east and pass several Re-Koils and Bristles until they find a lone Booster Barrel. Jumping in the barrel, they are raised to a higher area, where they pass a few Buzzes. If Dixie and her partner fall into the first gap, they land near a flagpole. Raising the pole's flag ends the level. The "K" is located at the bottom left corner of the first Lurchin. Shortly after the Koco and blasting to the left out of a Barrel Cannon. A Re-Koil bounces around the "N", located to the right of a water-filled pipe. A red Buzz orbits the G after the underwater segment with Enguarde, to the left of the Re-Koil. 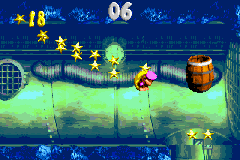 At the start of the level, the Kongs must pass the first Bear Coin and several Bristles. They eventually find a gap in the ceiling, which they can enter a hidden Auto-Fire Barrel from by using the Team-up move. This blasts them to a higher location with a Koin. Dixie and Kiddy must head up the pathway, where a Steel Keg is at. They must pick it up and gently throw it at the wall. They must outrun the Steel Keg and jump over the Koin, who is then defeated by the Steel Keg. The Kongs ride Enguarde on land. There is a bug that allows Enguarde to skip past its No Animal Sign. Dixie and Kiddy must leave it in front of the sign and proceed downward to a drained section. They can find Enguarde near some Bristles, directly parallel of the position he was dropped off at. This page was last edited on April 10, 2019, at 13:43.